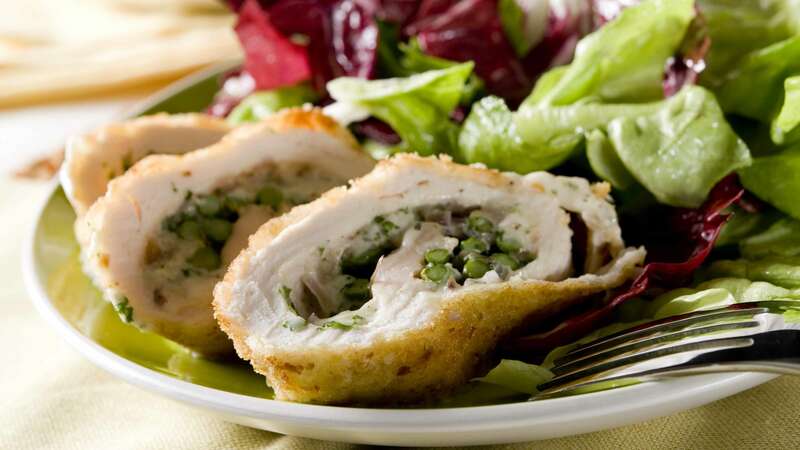 Cut the chicken breast in half, length-wise, leaving it intact on one side (creating a pocket to stuff). Season the inside of the chicken breast with salt and pepper and a pinch of lemon zest. Lay shredded cheese and 3 to 4 stalks of asparagus in the center of each chicken breast and fold over, enclosing the filling. Season the outside of the chicken breast with salt, pepper, garlic powder and paprika. Heat a large, oven safe skillet over medium-high heat and add the 1 tbsp olive oil, swirling around to coat the bottom of the skillet. Cook the chicken top side down, for 3 to 5 minutes, until the chicken easily releases from the pan and is golden brown on top. Flip the chicken over and cook an additional 3 to 5 minutes to sear the bottom side. Carefully cover the skillet with tinfoil and place in the preheated oven. Bake for an additional 15 minutes, or until the internal temperature of the chicken reaches 155 degrees. Carefully remove the skillet from the oven and let sit, covered, for about 5 minutes. The temperature of the chicken should rise to meet 160 degrees and will be super tender and juicy! Enjoy!